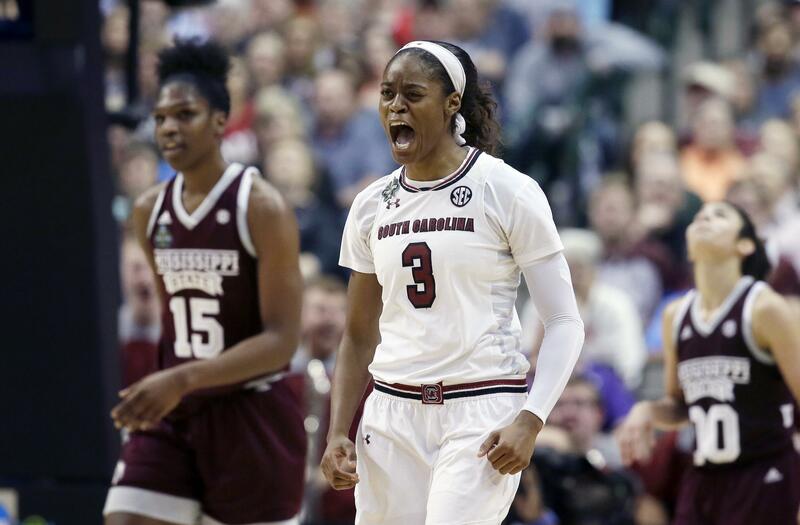 Tue., April 4, 2017, 12:10 p.m.
NEW YORK – South Carolina coach Dawn Staley says Kaela Davis and Allisha Gray are leaving the NCAA champion Gamecocks to enter the WNBA draft. Gray posted on Twitter that she was giving up a fifth year of college to go pro. Staley says as of last night, neither player had hired an agent. The league allows players up to five days before the April 13 draft to rescind their decision if they haven’t signed with an agent. Davis and Gray helped the Gamecocks to the national championship with a 67-55 victory over Mississippi State on Sunday. Davis, the daughter of ex-NBA player Antonio Davis, was a high scoring guard from Georgia Tech who transferred after her sophomore season. Gray came from North Carolina, also as a sophomore. The two sat out the 2015-16 season due to NCAA transfer rules before making a major impact this season. Each started 36 of 37 games with Gray averaging 13.2 points and Davis 12.7 points. Davis was also the team leader with 59 3-pointers. The two were essential to South Carolina’s NCAA Tournament run. Davis scored 23 points in a 71-64 win over Florida State to lift the Gamecocks to the Final Four. Gray had 18 points, 10 rebounds and three blocked shots in her team’s title win over Mississippi State. Should both remain in the draft, South Carolina would lose three starters. Senior Alaina Coates, injured before the NCAA Tournament, is considered a likely top WNBA pick. Staley said the 6-foot-4 Coates, who averaged 12.9 points and 10.7 rebounds this season, was called by the WNBA to attend the draft in New York next week – a strong indicator Coates will be among the first players selected. The Gamecocks have a transfer from Kentucky in Alexis Jennings, a 6-3 forward who sat out this season, poised to fill in some gaps underneath. Jennings averaged 8.9 points and 5.4 rebounds in two seasons with the Wildcats. While the two Gamecocks players decided to potentially leave early, about a half dozen other top college players opted to stay in school. Ohio State’s Kelsey Mitchell, Tennessee’s Diamond DeShields and Mercedes Russell, Duke’s Lexie Brown and Rebecca Greenwell all chose to return for their final seasons. The WNBA has strict criteria on when players can declare for the draft. Players must turn 22 the year of the draft and have their incoming class graduating. More players were eligible this year because they had transferred schools. Unlike the NBA, where players can make millions of dollars by leaving school early, the WNBA salary for a rookie is about $50,000 during the summer season. American players can make substantially more playing overseas in the winter. A few college players have decided to leave early in recent years. Notre Dame’s Jewell Loyd and Minnesota’s Amanda Zahui B. left college to turn pro in 2015. AP Sports Writer Pete Iacobelli contributed to this story from Columbia, South Carolina. Published: April 4, 2017, 12:10 p.m.